Harris machine cutting torches are designed to handle all types of machine cutting applications. Rugged and dependable, these torches provide up to 15” cutting capacity. 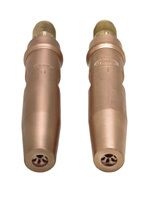 The 98-6 series torches are available in two-hose and three hose design for all fuel gases at pressures as low as 4oz. Separate preheat and cutting oxygen valves for high and low preheat control. Three-hose valveless design for pipe beveling, multiple beveling and similar applications. Harris 80 "Jumbo" machine cutting torch has a recommended cutting range of 8" to 30". It operates on a fuel pressure of 10-15 PSIG using oxy-propane/propylene based fuels or oxy-natural gas. A 1/2" I.D. Class "C" connections (7/8-14) is required for the cutting oxygen. 1100030 80R 3 HOSE & RACK 20"